During the holiday malarky it’s still important to eat right. Wish all you want, but chocolate peppermint bark & shortbread don’t count as nutritious! 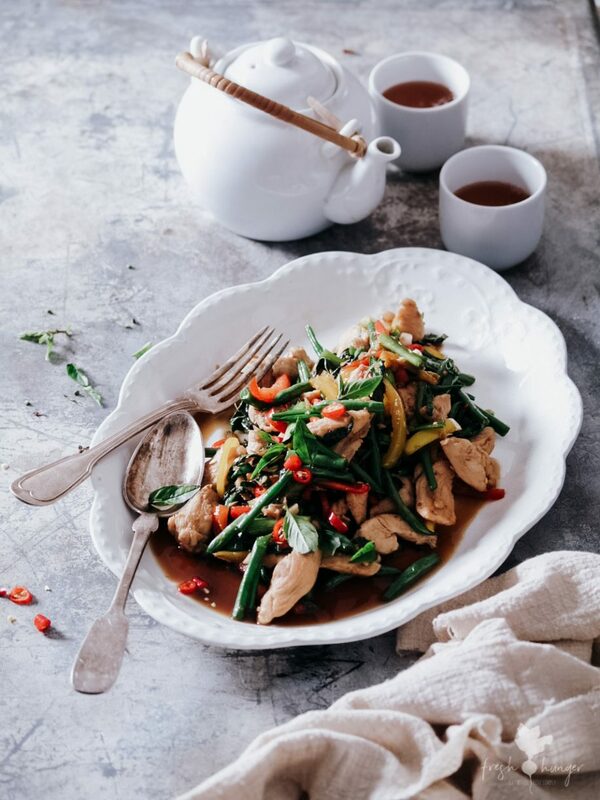 Thai Chicken Vegetable Stir Fry is the answer for those nights when you need fast and wholesome. And the best part is – it tastes as though you popped into town for Thai take-out. When it comes to food, there are few things better than the flavors & heady aromas of Thai cuisine. 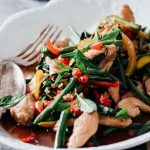 Not just all coconut based curries, Thai cooking is diverse as it is flavorful: Thai stir-fries are certainly more vibrant & exotic than your bog-standard Chinese stir-fries. Unlike Chinese stir-fries, Thai stir-fries aren’t thickened with cornstarch. The cooking in this recipe liquid is fairly runny, making it perfect to serve with steamed jasmine or coconut rice. See my tips here for cooking the perfect rice. And here for coconut rice. I love to cook & eat Thai food. Mostly I cook it myself (being that we live on the outskirts of a restaurant desert) but I did find a half-decent Thai restaurant about 30 miles away. I’ve had lunch there twice & both times I ate Thai basil chicken & vegetable stir-fry. Actually, one of those times I ordered shrimp but I was given chicken, too hungry to send it back, I gobbled it down. I ordered it hot. Feeling adventurous? There’s extra hot & Thai hot. Next time I’m going to be brave & order Thai hot for the ultimate scalp sweat & chili high. 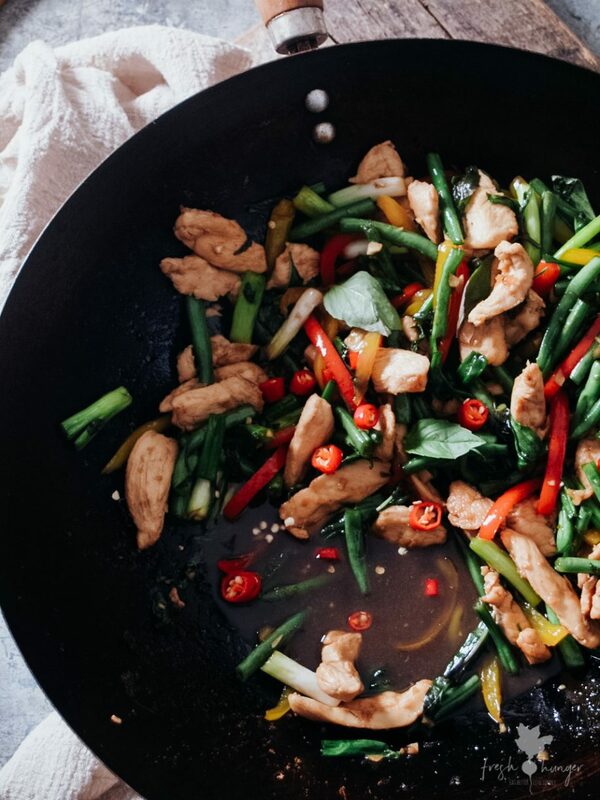 Thai basil has a way of transforming a recipe with its unique taste & fragrance. 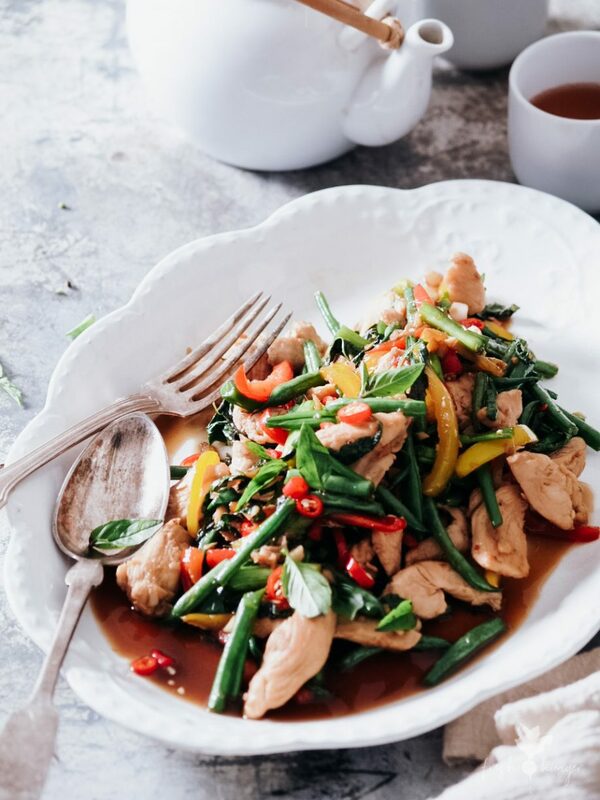 It’s added to this stir-fry in the same manner you’d add spinach leaves to a salad – by the handful. 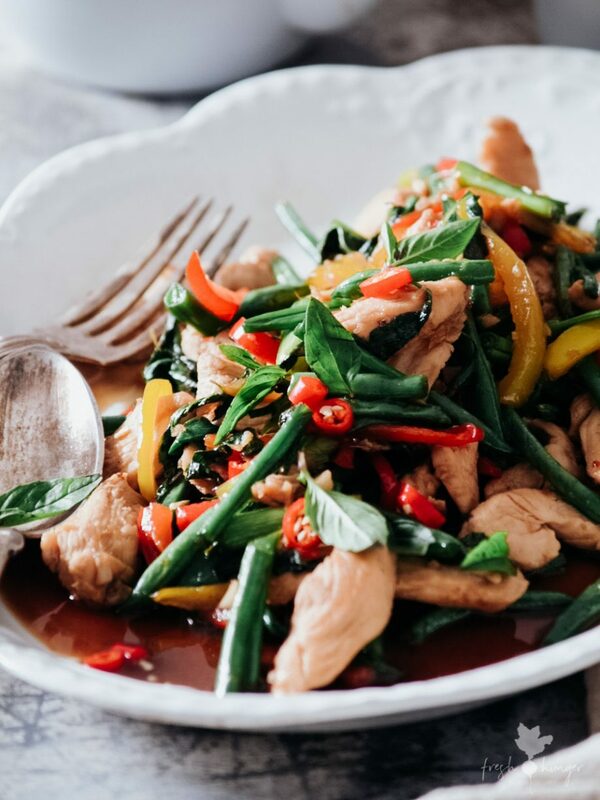 Not everyone may have access to Thai basil – it’s the basil with the purple stems, so in a pinch you can use your regular garden variety basil (sweet basil). But search for it. In my town of 750 people I have access to nothing unless I’ve grown it, so I drove 40 miles to buy the Thai basil for this recipe (Costco is across the road from the Asian market so it’s a win-win). In summer I grow a variety of basil, but (sadly) when the cold comes to Indiana, the basil is the first thing to wither. 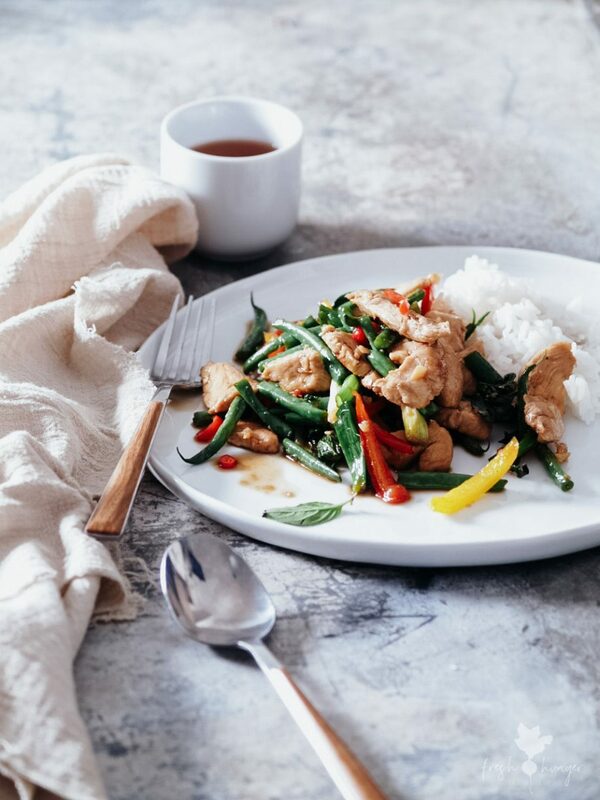 Believe me, this recipe is worth doing a little detective work to find Thai basil. It usually comes in a giant bunch, more than you’ll need for this one recipe. So make it again, maybe with shrimp or beef & switch the beans for snow peas or add some mushrooms; just remember not to overcrowd the wok. It’s a recipe I could eat every week & never tire of: I hope you make it & feel the same. A quick & easy dinner with lots of wholesome vegetables in a heady sweet sauce. Make sure to cook some steamed jasmine or coconut rice. 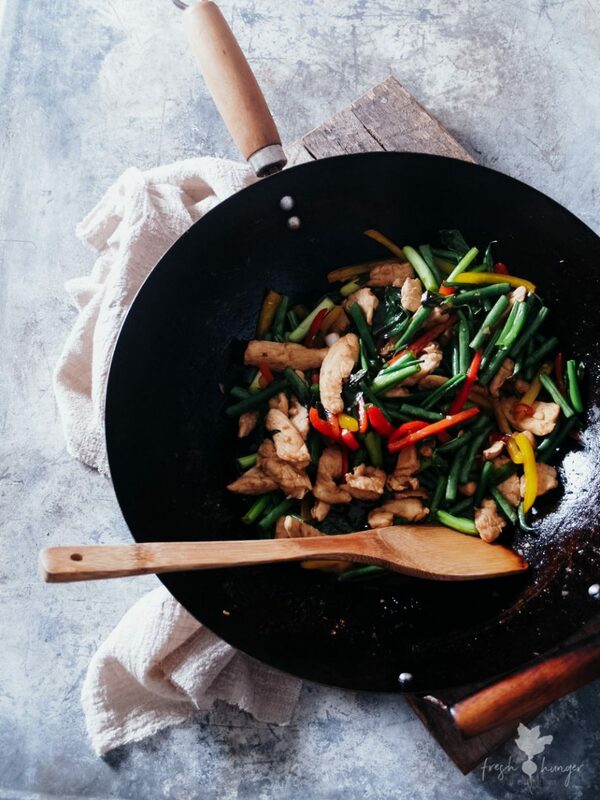 Heat coconut oil in large wok or frying pan over high heat. Add chicken & stir-fry until golden & cooked, about 5 minutes. Add garlic, garlic, peppers & beans. Stir-fry for 1 minute until veggies are bright in color. Add chilies. Add fish sauce, palm sugar, soy sauce & a pinch of salt. Stir-fry 1 minute or until veggies are tender but still crisp. Add chicken; stir-fry about 2 minutes until hot. Serve with jasmine rice if desired.